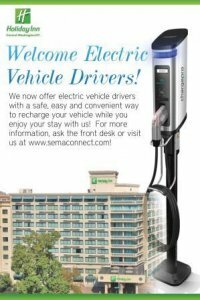 The Holiday Inn Washington DC- Central/White House is excited to announce that it has completed the installation of the ChargePro electric vehicle (EV) charging station for guest as well as public use. Guest staying at the Holiday Inn Washington, DC- Central/ White House have the opportunity to charge up their electric vehicles rite onsite for FREE when they use our parking garage! Commuters and local residents will also be able to pay a fee to charge their vehicles at the station. The charging station is a Type 2, J1772 charging plug (Chevy Volt, Nissan Leaf, etc.). Since a 240 volt station-- your vehicle is charged up fast! We have always been committed to a green vision and we know our guest are looking for energy alternatives. We are proud to be able to offer electric vehicle charging stations to our guest.